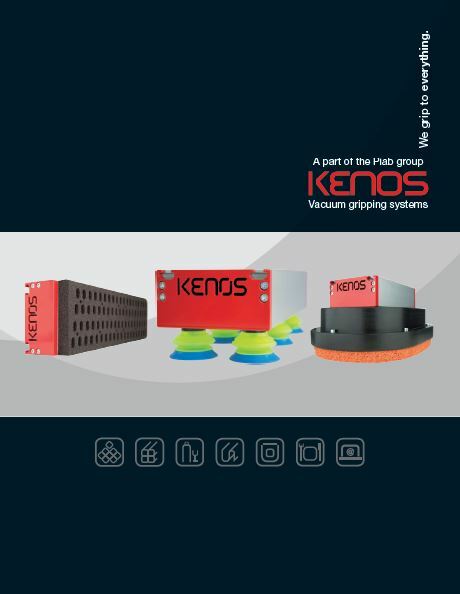 Kenos™ is a leading brand for large area vacuum grippers. It is designed and optimized to be used in various applications e.g. packaging, wood, food etc. The product group represents a flexible solution for the handling manipulation of several products with different shapes, dimensions and compactness. Most of the gripping systems can be equipped with integrated vacuum generation or suitable for separated vacuum generation (Pump or Side channel blower). The integrated vacuum generator is a modular multi-stage COAX® ejector of easy maintenance and the market’s most energy efficient ejector technology. The number of ejectors can also very simply be increased even after the installation if necessary. The foam is made of a technical foam (FDA mat approved available), with different pitch holes and thickness or pads depending of the product to be gripped and on the requirement of the application. KVG series represents a flexible solution for the handling manipulation of several products with different shapes, dimensions and compactness due to the double technology available. Check valves or flow reducers can fulfill the needs of many industrial sector applications. The KVG gripping system can be equipped with integrated vacuum generation or suitable for separated vacuum generation (Pump or Side channel blower). The integrated vacuum generator is a modular multi-stage COAX® ejector of easy maintenance. The multi-stage COAX® ejector used offers the possibility to be simply increased even after the installation if necessary. The mat of the KVG gripping system is made of a technical foam (FDA mat approved available), with different pitch holes and thickness or pads. Kenos™ Heavy Vacuum KHVG series products, are designed for heavy duty applications in the wood and stone industry. KHVG gripping systems are suitable for handling, normally complete layer, of sawn timber, heavy planking, raw wood and materials for building, such as bricks. They are also useful to handle very long and arcuate workpieces. KHVG systems are prepared for external vacuum generation with side channel blower. Provided with shutter check valve technology with low sensibility to the dust. KSG series products, Kenos™ Sack Gripper, are suitable to handle sacks with different shapes, weights and materials. The specific knowhow in this segment, has driven us to develop systems dedicated to all the different applications of this industry. The integrated and modular vacuum generation makes the KSG flexible and reliable. The version for external vacuum generator is available. We have versions for palletizing or de-palletizing. KBC series products, Kenos™ Bag Cup, born from the need of handling in the food industry and handling liquid bags they are suitable also with flow pack applications. In KBC vacuum gripping systems, the integrated and modular COAX® vacuum cartridge gives the module flexibility. A version for external vacuum generation is available. A side channel blower is used when the application condition suggests it. Kenos™ Vacuum Layer – Cans Jars, born for the need to handle the complete layer of cans, jars that can be open or closed on the gripping area. Typical industrial segments involved are palletizing or de-palletizing in packaging, beverage, food.